A metropolitan skyscraper dissolves the mute shaft of the generic and reconnects the tower to the city. 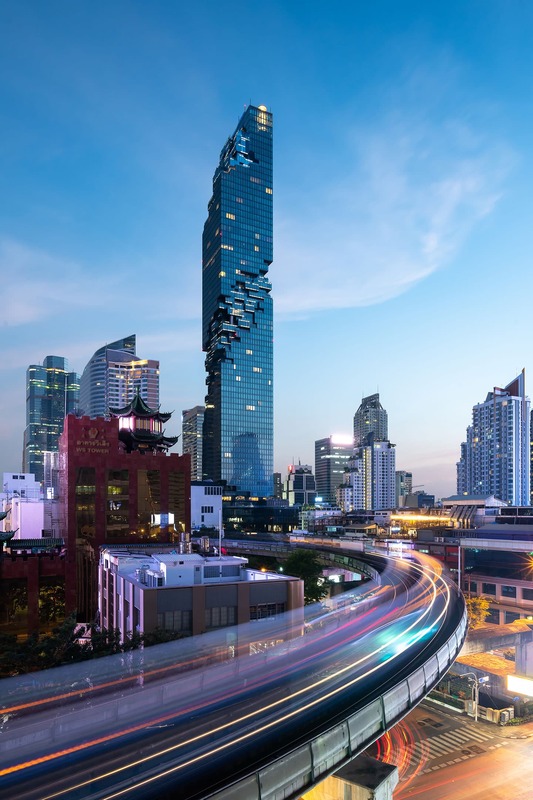 MahaNakhon acts as a prototype that generates shared spaces of urban and social interaction and reinstates an explicit responsibility of architectural space towards society as a greater whole. 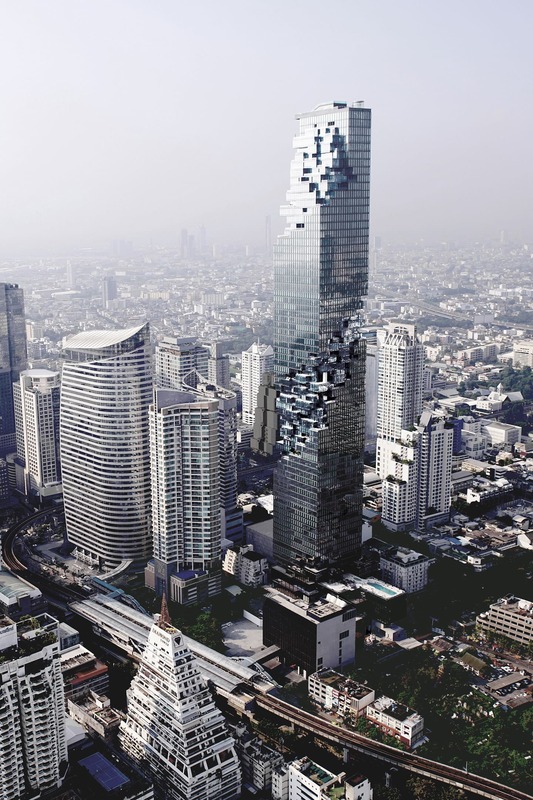 MahaNakhon, as an embodiment of architectural intentions as well as an example of how architecture can engage the city and surrounding social space to stand as a representation of the city’s aspirations and position as a global city of unique and powerful qualities. 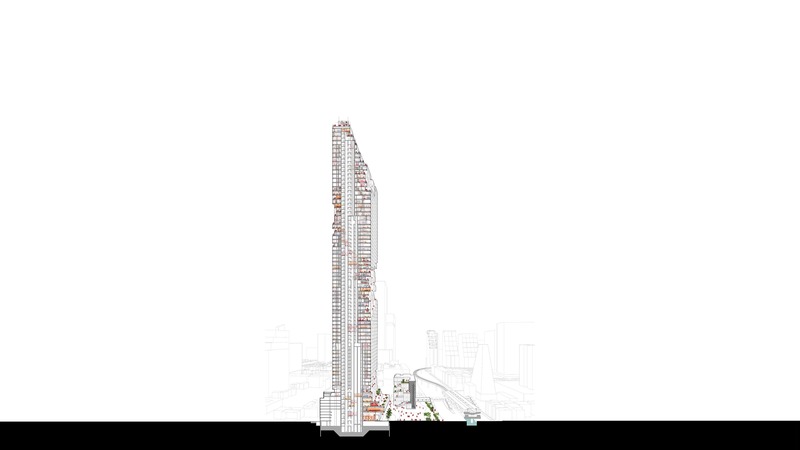 We see architecture as process and the building as a dialogue - between large and small scale, symbolism and activity, the city and its inhabitants, inside and outside. Bangkok is a city of many contradictions - and of an untamable energy. 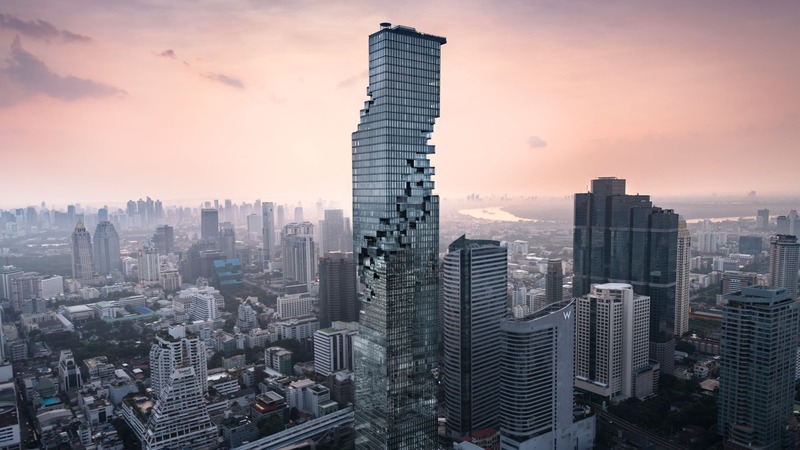 MahaNakhon dismantles the traditional formula of a seamless, inert, glossy totem, and instead actively engages the city: Its pixilated and carved presence opens and connects to the surrounding urban fabric rather than overpowering it. Its glittering stacked surfaces, terraces and protrusions simultaneously create the impression of digital pixilation while echoing the irregularity of ancient mountain topography. 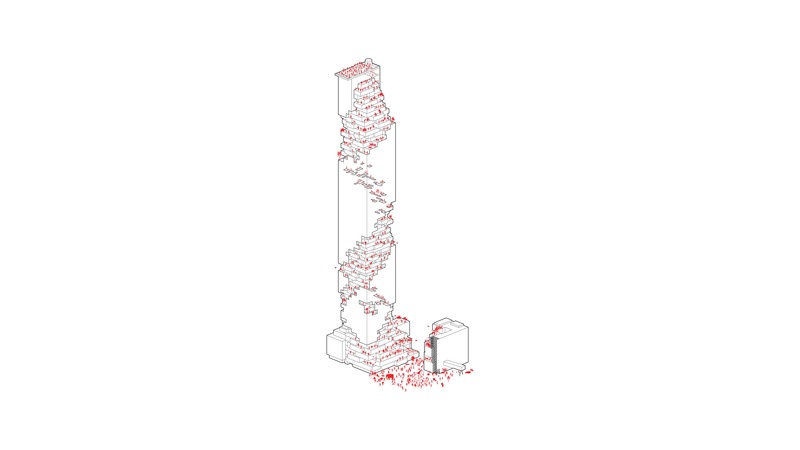 This architectural geography introduces a three dimensional ribbon of architectural pixels that circle the tower's full height, as if excavating portions of the tower to reveal the inner life of the building - both metaphorically and actually an architecture that reveals its inner life, its inner scale to the city. 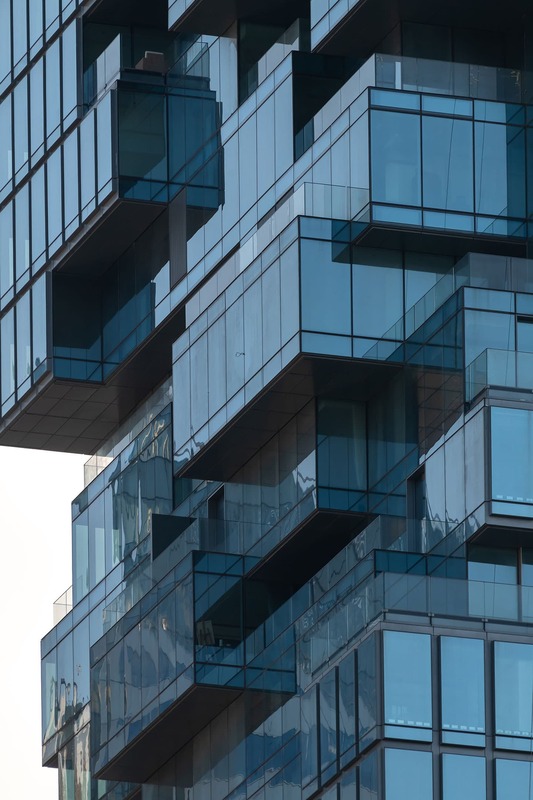 What from afar might evoke a sense of being yet unfinished, reveals itself to be not a purely formal gesture, but an erosion that generates actual living spaces: terraces, balconies, floating rooms and apartments that merge the tropical outdoors with the indoors. 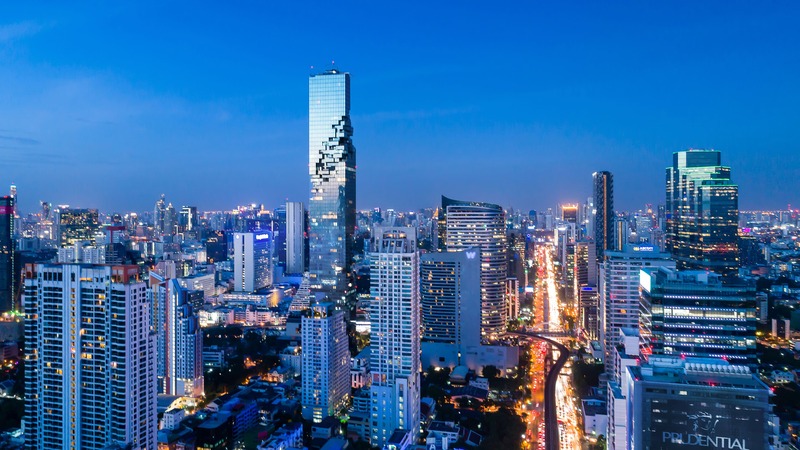 This urban geography of elements convey the energy, intensity and inclusiveness of Thai society and celebrate Bangkok’s emergence as a true global capital, fitting the Thai meaning of the name MahaNakhon, translated as the ‘great metropolis’. 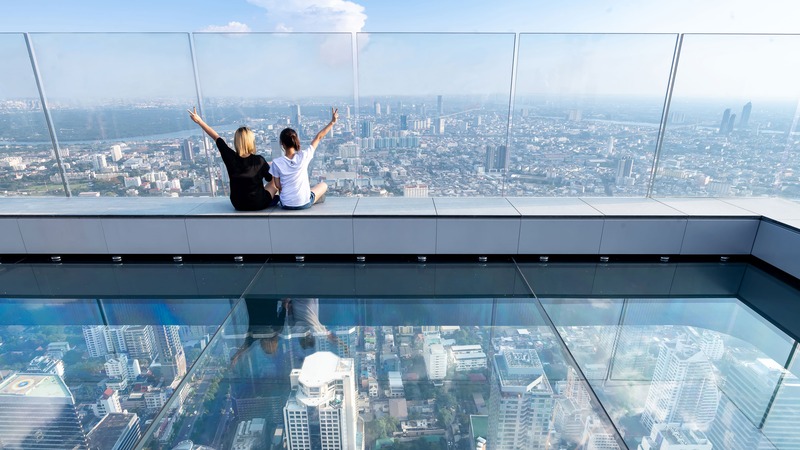 The complex, at 150,000 square meters communicates intimately with Bangkok from the ground up: its series of components comprise MahaNakhon Square, a landscaped outdoor public plaza functioning as a new public destination within the city; MahaNakhon Terraces, 10,000 square meters of retail space with lush gardens and terraces spread over multiple levels for restaurants, cafes and a 24 hour marketplace; The Ritz-Carlton Residences, Bangkok with 200 highly-customized single-level and duplex homes, each offering the atmosphere of a skybox penthouse, managed by The Ritz-Carlton with amenities for all residents; The Bangkok Edition, a boutique hotel with 150 hotel rooms, a collaboration between Marriott International and renowned hotelier Ian Schrager. 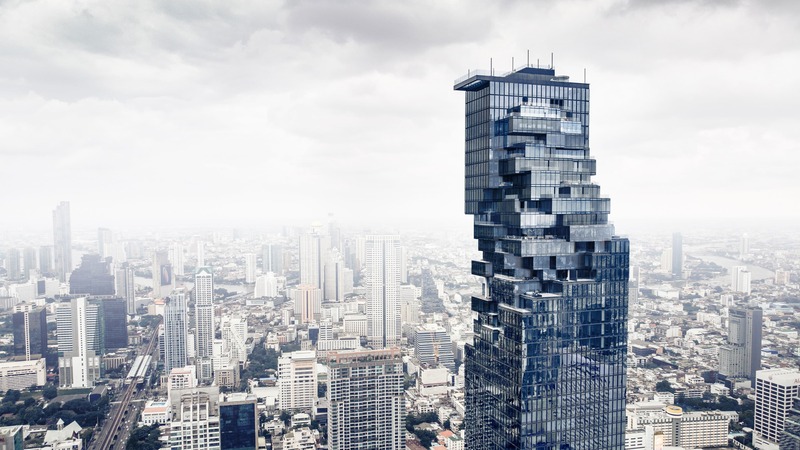 MahaNakhon dissolves the typical tower-podium typology to render not a tower in isolation but instead a skyscraper that melds with the city as it moves vertically between ground and sky. Generous, cascading indoor/outdoor terraces at its base evoke the shifting protrusions of a mountain landscape and form an outdoor atrium reminiscent of a natural valley with lush tropical gardens containing a multitude of social spaces. 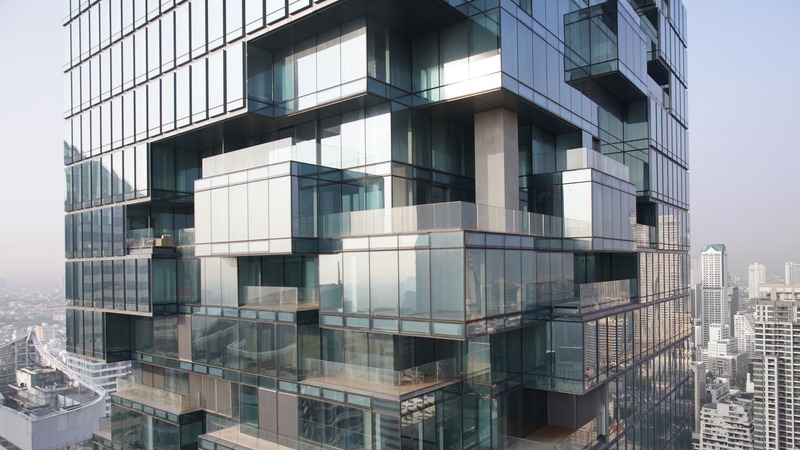 MahaNakhon also features an adjacent freestanding 7-storey building known as the Cube, with multi-level indoor/outdoor terraces corresponding to those of the Hill Terraces across the expanse of an outdoor atrium that serves the general public via a direct above-ground pedestrian link to the main CBD Skytrain station and plaza-level access, Residences in the main tower of MahaNakhon, as well as guests of the hotel. 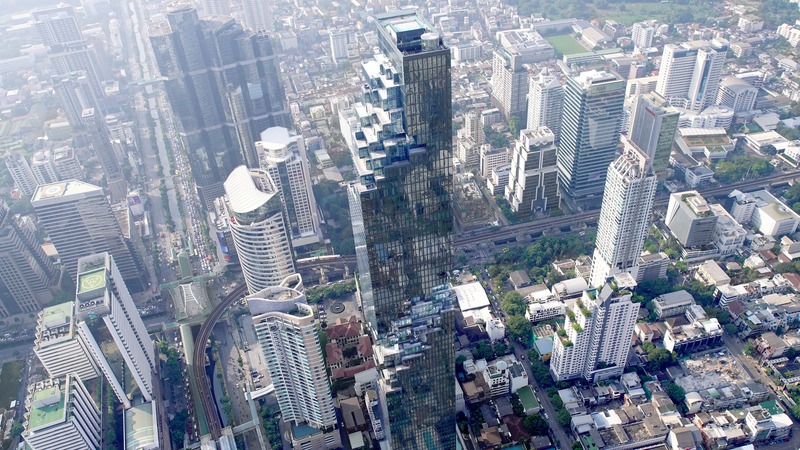 MahaNakhon Square, located in front of the tower, is intimately connected to the space between The Hill and Cube. This dynamic public plaza has developed as a meeting place, a spot for planned and spontaneous cultural events and as a retreat for the city’s inhabitants, a gathering place, a rare venue for cultural and social interactivity, an urban oasis that provides refuge from the intense daily clamor of greater Bangkok while being intimately connected to its public fabric. 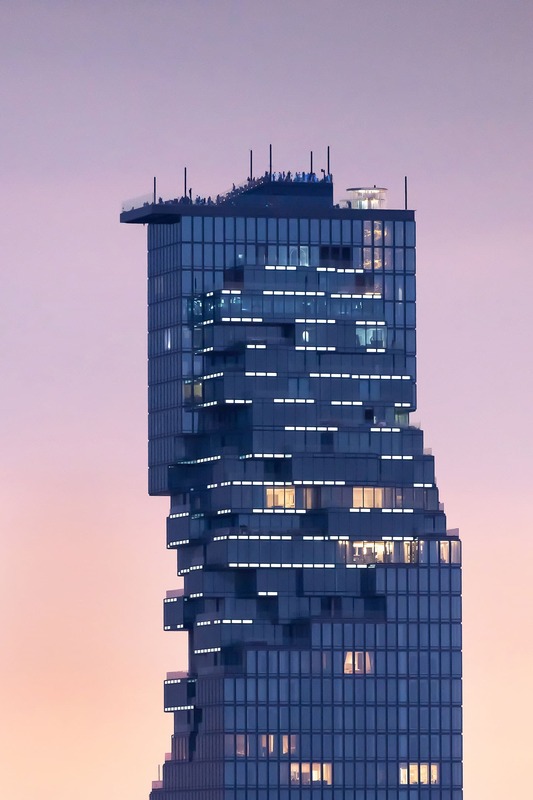 MahaNakhon Tower itself has been carefully carved to introduce a distinctive profile while generating a set of specific features – projecting glass skyboxes with sweeping views and generous indoor/outdoor spaces with plunge pools and oversized terraces – uncommon to high-rise living in metropolises, but well-suited to the tropical climate of Bangkok. 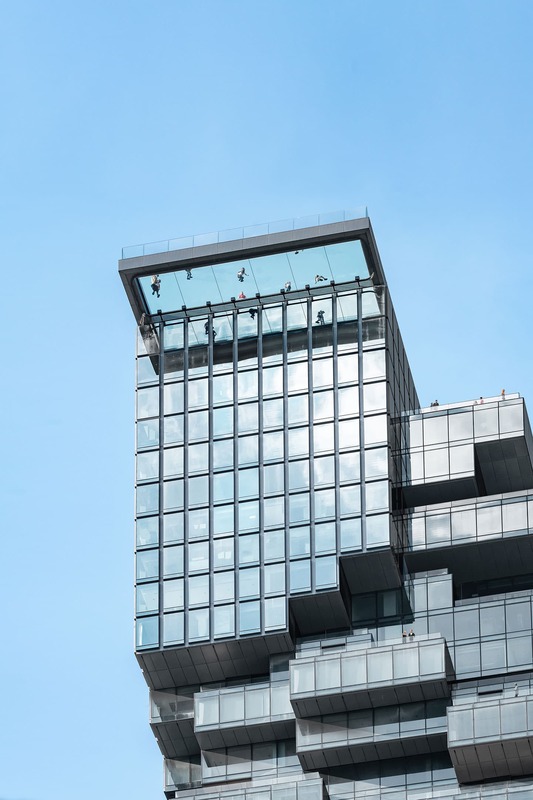 The pixels have been designed to maximize unobstructed panoramas for the residences, offering rare bird's-eye views of the city and the Chaophraya River. 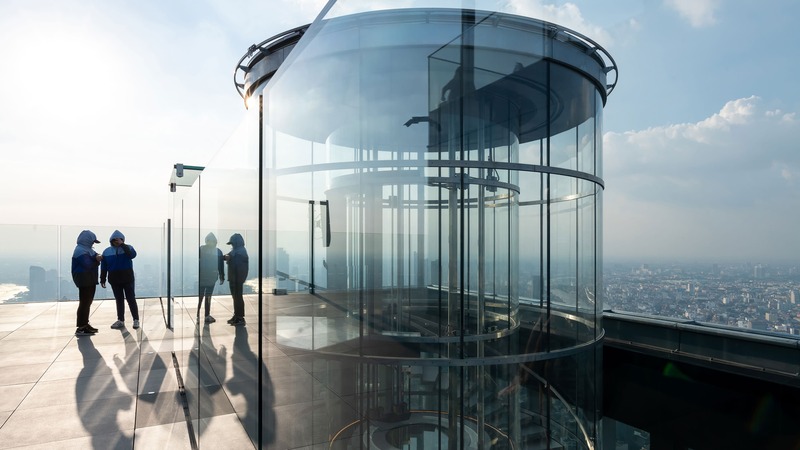 The top of the MahaNakhon tower houses a multi-level three-floor Sky Bar and restaurant with dramatic double-height spaces, private dining facilities for entertaining, and a rooftop outdoor bar with sweeping 360° views of the skyline and river, floating 314 meters above the city. The combination of these elements forms a symbiotic whole which is greater than the sum of its parts. 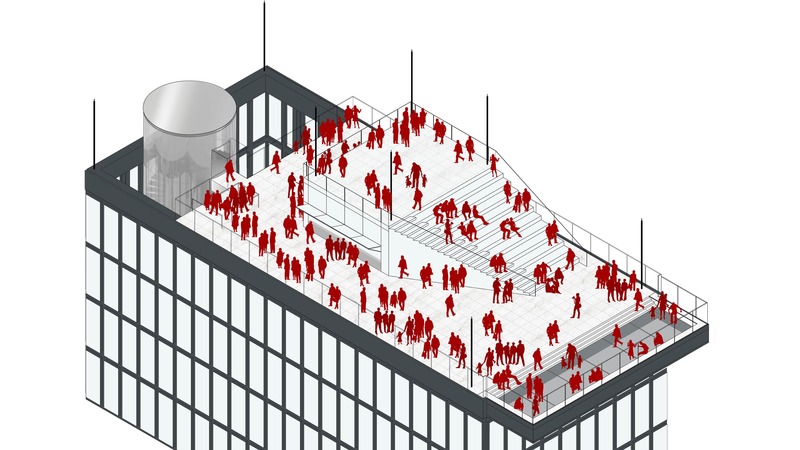 The activity of the city is drawn into the site through physical connections to the Sky Train and public transportation network, but also through its integration with the surrounding grain of the city and urban street life. 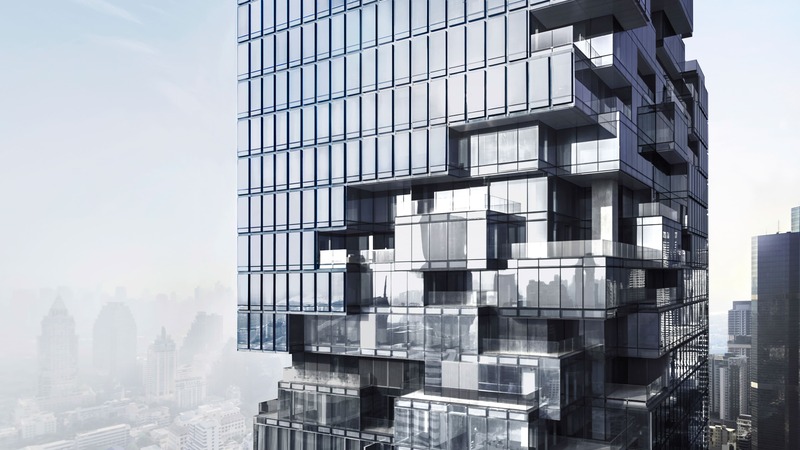 MahaNakhon creates a new typology of a contemporary high-rise building that is socially connected.